Theorists and educational practitioners highlight the importance of education for sustainable development. The development challenges have resulted from complex environmental and socioeconomic factors. In this context higher education training is discussed as an approach that can support the adoption of sustainability and further contribution to community development. From a strategy approach, the universities can optimize their role as agents of change with regard to sustainability by adopting a “whole-of-university” approach to sustainability. This approach explicitly links research, educational, operational, and outreach activities and engages students and other stakeholders in each. Community members can therefore act as agent of change in order to incorporate sustainability initiatives in their activities. This will provide many private and public benefits toward achieving sustainable development. Over the past decades, the global population grew rapidly especially in the developing and emerging countries, but the social and environmental impact of natural resource extraction remain significant challenges. Various environmental activities ranging from deforestation to greenhouse gas emissions are challenges that might affect a nation in achieving sustainability (Schaltegger et al. 2011; WCED 1987), suggesting the need to preserve the environment and natural resources while addressing the social and environmental issues critical to inclusive and sustainable growth. The developing countries face the obvious life-threatening challenges of desertification, deforestation, and pollution and endure most of the poverty associated with environmental degradation. On the other hand, industrial nations face the life-threatening challenges of toxic chemicals, toxic wastes, and acidification (Schaltegger et al. 2011; WCED 1987). The global climate change is another factor creating more challenges in achieving sustainability. Climate change intensifies the already adverse environmental and socioeconomic conditions of vulnerable communities. Thus, the need to educate people on natural resource preservation while addressing social and environmental issues are critical to inclusive growth and sustainability of any nation. The Brundtland Report defined sustainable development as maintaining the capacity of ecological systems to support social and economic systems and ensuring the long-term productive potential of resources and their environmental functions (Schaltegger et al. 2011). A development is sustainable when it ensures that it meets the need of the present without compromising the ability of future generations to meet their own needs (WCED 1987). Humanity has the ability to make development sustainable to ensure that it meets the needs of the present without compromising the ability of future generations to meet their own needs. The concept of sustainability has received much attention since the publication of the Brundtland Report by the World Commission on Environment and Development in 1987 (Harding 2006). Despite the institutionalization of sustainability principles through legislation and policy around the world, progress in implementing sustainable development actions has been slow (Harding 2006). The consequence of this is that resources are disappearing because of overexploitation and damage resulting from an unsustainable use of these resources. A study by Rothenberger et al. (2006) shows that waste is considered to be one of the most immediate and serious environmental problems confronting urban governments in developing countries. The need to protect the community resources for the benefit of a suitable and sustained environment has become ever more urgent (Zhang and Matsuto 2010). Education about sustainable development is an approach for creating awareness and to use education as a tool to achieve sustainability. This improves the community by providing more knowledge needed to be spread to the various members of the community. Therefore the development of an improved higher educational and improved learning approach that is socially, ecologically, and economically viable to guarantee the principles of sustainability is necessary to achieve the goal of sustainable development in any given community. Institutions of higher education and community members are important stakeholders in implementing a development process and can act as a change agent in addressing the issue of sustainability. Thus the higher education sector can optimize their role as agents of change with regard to sustainability by embarking on transdisciplinary research training which can increase education learning through the engagement of various stakeholders such as students and community members. Education is a long-term process that results from general instruction in a variety of areas, which has a theoretical emphasis and is geared to knowledge acquisition and synthesis. It results from general courses and empirical experiences with interdisciplinary and professional orientation. The role of education training is crucial to the impartation of knowledge for the implementation of sustainable development. Higher education institutions may help to overcome these difficulties by developing new processes of change (Vargas et al. 2019). Higher education learning can be used as a tool to achieve sustainability. On the other hand, education for sustainable development does not only integrate contents such as climate change, poverty, and sustainable consumption into the education curriculum; it also creates interactive, learner-centered teaching and learning settings. Thus in recent years, sustainability and the need for its implementation and documentation in many different development initiatives are taking place around the world. Sustainability approach is worth developing for implementation and learning to integrate the principle. Unfortunately, progressing toward sustainable development remains a key global challenge. According to Vargas et al. (2019), the various interpretations of the concept of sustainable development and the questions it raises about economic growth make its implementation difficult. Furthermore, a study by Harding (2006) pointed out that despite the institutionalization of sustainability principles through legislation and policy around the world, progress in implementing sustainable development actions has been slow. Yet there is increasing recognition that the present development paths around the world are clearly not sustainable into the future and that more educational knowledge is urgently needed to address this unsustainability (Zhang et al. 2017; Harding 2006). In developing countries like Nigeria, municipal solid waste (MSW) management is a great challenge because of the increased population in urban areas. Increasing with the population of the state is not just the waste generated but the cost of handling it, and this underscores the need for more efficient and enduring system of solid waste management. Thus, sustainability of the environment requires filling the educational knowledge gap which is also very important especially in Lagos, Nigeria, where many are still flippant in their treatment of the environment. The environment is key to social economic living, and it is important that stakeholders pay close attention to it. Therefore, education in waste education will increase stakeholders acting as change agents to rise in championing the cause of sustainable environment by spreading the message in their various communities (https://lagosstate.gov.ng/waste-management). A sustainable waste management that embraces the three R’s concept of reduce, reuse, and recycle of waste holds the key to conserving the environment as they help to cut down on the amount of waste generated and thrown away. The three R’s concept presupposes that by working on a sustainable lifestyle to reduce waste, it supports a system that conserves natural resources, saves land, and protects the environment. Thus the development and integration of adequate municipal waste education will provide answers to how waste can be sustainably managed. A study by Zhang et al. (2017) reported that higher education universities and government institutes have the greatest potential and necessity for conducting waste management which can promote sustainable waste source separation on higher institutions. Understanding the characteristics of an institution’s solid waste stream is the first step toward enhancing the sustainability of a waste management system (Smyth et al. 2010). Thus, from a practical point of view, adequate higher educational knowledge is seen as a viable approach that is worth developing further for implementing sustainability in the community. However, the implementation of sustainability may fail, not only because of inadequate higher education but also because of low community member involvement. These factors could hinder the great benefits of sustainability to any society. Therefore, community learning through participation can promise the best result in achieving sustainable impact not only at economic and ecological level but also at the sociopolitical level. Education is a key and, therefore, is crucial for the achievement of sustainable development. Education can, and must, contribute to a new vision of sustainable global development (UNESCO 2017). Embarking on the path of sustainable development will require a profound transformation of how we think and act. The concept of education for sustainable development is an approach to stimulate approach for developing sustainability competencies. Education research has acknowledged the value of transformation, which offers an opportunity for researching and rethinking how appropriate and successful educational practices may be (Leal Filho et al. 2018). However, despite the role of transformation in higher education and particularly in sustainability learning, there is a need to engage with sustainability-related issues, more individuals to become sustainability change-makers. Investments in university educational research and development (R&D) can therefore turned the educational sector into a dynamic sector with rapid technological change in much of the world, including in achieving sustainability in infrastructure and industrialization. It is more important than ever for developing countries to promote scientific research education and training in different sectors, in order to contribute to sustainable development. The increased availability of education and knowledge-based approaches encourage sustainability learning in the community. However, not all kinds of education support sustainable development. Education that promotes economic growth alone may well also lead to an increase in unsustainable consumption patterns. The now well-established approach of Education for Sustainable Development (ESD) empowers learners to take informed decisions and responsible actions for environmental integrity, economic viability, and a just society for present and future generations. Sustainability education aims at developing competencies that empower individuals to reflect on their own actions, taking into account their current and future social, cultural, economic, and environmental impacts, from a local and a global perspective. The environmental sustainability refers to meeting the resource and service needs of current and future generations without compromising the health of the ecosystems that provide for them (Morelli 2011). It is intended as an articulation of the professional goal of the environmental manager and other environmental professionals. Institutions of higher education are poised to play a significant role in the search for a more sustainable future. Furthermore, individuals should also be empowered to act in complex situations in a sustainable manner, which may require them to strike out in new directions, and to participate in sociopolitical processes, moving their societies toward sustainable development. 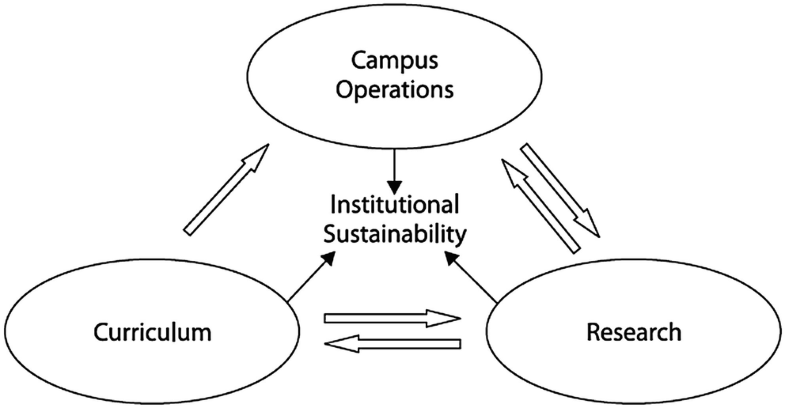 Mcmillin and Dyball (2009) observed that most universities are tackling sustainability issues in a compartmentalized manner, sustainability education is confined to specific courses, education is often isolated from research, and neither is likely to be linked to sustainable campus operations. On the other hand, Warburton (2003) notes that deep learning is a key strategy by which students extract meaning and understanding from course materials and experiences. Because of the range and interconnectedness of environmental, social, and economic issues and the importance of interdisciplinary thinking and holistic insight, deep learning is particularly relevant in the context of education for sustainability. Education needs to play a key role in attitude change. Environmental education and sustainability offer good models to develop curricula that encourage critical and creative thinking, problem-solving, effective decision-making, and conflict resolution. To be successful, sustainability education must help students develop a versatile style of learning that balances operation and comprehension learning – thereby reducing the chance that some students (e.g., from science) are unable to describe the meaning of what they know while others (e.g., from arts) are incapable of deductive reasoning. Educational learning on sustainability aims at developing competencies that empower individuals to reflect on their own actions, taking into account their current and future social, cultural, economic, and environmental impacts, from a local and a global perspective (UNESCO 2017). The development of sustainability and adoption of its principles requires that university education begins to stimulate learning in the context of sustainability-oriented innovations. Stakeholders in the community should be made aware of the benefits that exist in integrating environmental and socioeconomic topics into their operations in order to contribute to sustainable development. The university education can play a significant role in search for a more sustainable future by offering courses that are either self-paced or instructor-paced to the students. This approach to learning therefore has an importance, since it can help students not only in their courses, but also in developing them as trained personnel in diverse areas crucial to management and sustainability. On the other hand, Mcmillin and Dyball (2009) report that some sustainability education is confined to specific courses, education is often isolated from research, and neither is likely to be linked to sustainable campus operations. Thus applying sustainability principles to the role of university education requires holistic and integrated approach (Fig. 1). Additionally, an analysis is required that considers the inputs and outputs to the research system, curriculum development, as well as in-campus operation. Sustainable education is relevant to all areas of life, economic, environmental, and socioeconomic processes. To be viable in the future, stakeholders such as students and community individuals require culturally rooted, socioeconomic, and environmental development that reemphasize and innovatively integrate ecology, social, and economic dimensions. Providing for such could empower stakeholder to act in complex situations in a sustainable manner, which may require them to strike out in new directions and to participate in sociopolitical processes, moving their societies toward sustainable development. Progressing toward sustainable development remains a key global challenge. And yet, the various interpretations of the concept of sustainable development and the questions it raises about economic growth make its implementation difficult. Higher education institutions may help to overcome these difficulties by developing new processes of change. However, to achieve this they need to integrate sustainable development in all their areas of activity (Vargas et al. 2019; Flynn et al. 2018). In order to enhance the understanding of sustainability and to facilitate the planning and implementation of adaptation strategies, increased deeper consideration of the factors that promote its knowledge particularly at the community level is required. This would further improve understanding of barriers and identify gaps in the state-of-the-art knowledge (Shackleton et al. 2015). This benefits the community stakeholders providing knowledge, encouraging systems thinking, and improving the ability to put knowledge into action, accumulating skills for use at some later date. A practical approach with sustainability initiatives builds problem-solving and critical-thinking skills that stimulate community learning in the context of sustainability-oriented innovations. A community program such as community gardening and conversion of municipal waste provides knowledge on how community education and application skill could contribute to community building for sustainability. Furthermore, such programs could also provide educational resource providing a valuable platform for learning about multiple dimensions of sustainability through community education. Consequently, the benefits of community gardening are little known and not directly applicable to the community gardens project and situate it firmly within the scope of education for sustainability. Despite these circumstances, the role of community gardening in fostering community development remains an important approach to sustainability. Thus, the higher education sectors can embark on programs that engage people and promote community learning that encourages a behavior change for sustainable development. In developing countries where waste management is a challenge, education on recycling is an important approach of sustainable municipal solid waste management (MSWM) (Troschinetz and Mihelcic 2009). Thus community education through participation could offer a comprehensive solid waste management programs that contribute to one of the greatest environmental challenge. A change agent is a specialist who typically recommends adjustments to improve productivity, employee relations, and profit margins. He normally focuses on amending or replacing policies and procedures that may be hindering growth. He acts as a catalyst for change. The approach a change agent takes in helping organizations improve their operations is often considered his main asset and what distinguishes him from a traditional business management consultant. He is customarily expected to present solutions in a manner that inspires and motivates management and staff to change for the greater good of everyone. A change agent generally concentrates on engaging members rather than offering harsh criticisms along with must-do lists of inflexible solutions. Change agent tries to contribute to sustainable development by enabling different forms of learning (van Poeck et al. 2017). Community members can act as a change agent of sustainability. For example, by providing them with specific innovative ideas from professionals in various fields of sustainability develops their knowledge and abilities, to integrate necessary changes in their organizations. Community education provides a platform involving participation in development. A wide range of development agencies, both national and international, have attempted to involve people in some aspect of planning and implementation. Participatory approaches are increasingly being used in sustainability projects, climate change impacts, adaptation, and vulnerability research assessments (Flynn et al. 2018). Community learning can bring about an organizational change. This is the reason why promoting community participation and learning on sustainability can help improve their ability to effect change. Furthermore a community member can bring about a desired change when this individual or a group takes responsibility for changing the existing pattern of behavior of people or the social system. Change agents could also support the implementation of new ideas into actual action. With their involvement, they tend to be more thoughtful as they have to live with the consequences of their actions. The act of providing advice and assistance to the communities will enhance their organization knowledge, perspective, and information to be able to implement sustainability management. Learning on the basis of real societal challenges in local contexts requires cooperation with external partners. Education should thus enable access to external educational material by communities and various institutions. Community learning through participation can promise the best result in achieving sustainable learning on the basis of real societal challenges in local contexts. However, for this to become successful, it requires cooperation with different stakeholders and partners (Shackleton et al. 2015). Community-based learning can strengthen the communities’ right to adequate information. For example, in a peer learning approach, it aids in developing a way of sharing, observing, and helping each other in the learning process. Communities who control their resources and participate in local decision-making process have the potential to create changes that go beyond the local community level. Community participation promises the best result in achieving sustainable impact not only at economic and ecological level but also at the sociopolitical level. It can also strengthen the communities’ right to adequate information. The peer learning approach is an example that helps members to develop a way of sharing, observing, and helping each other in a learning process (Shackleton et al. 2015). Additionally open communication and peer learning create spaces for experimental learning and are important elements of developing learning process at community level. Therefore participatory involvement for community stakeholders should be carried out in relation to sustainability. Through exchanges the importance of sustainability can be learnt and facilitate further exchange of knowledge. Furthermore the exchange of experience organized within a participatory process can help community members become very active with initiative, empowerment attaining toward sustainable development. Education is any process or activity that engages people in learning by sharing and developing knowledge, skills, and attitudes and can take place through formal processes, e.g., through the delivery of specific curricula in schools, universities, and/or other training institutions, or through nonformal processes, e.g., recreation, community participation activities, and experiential learning programs (Corkery 2017). In the case of “education for sustainability,” the implication is for a more “holistic” and “integrated” environmental education that leads to the development of a sustainable society. Community education can further contribute to a positive sense of community by developing understandings of different aspects of activities that are relevant to sustainability. Community learning through active participation in sustainable waste management and community gardening could help in the planning and implementation of sustainability. Community members learn methods which involve building a culture of change, one that supports the sustainability and long-term strategy of their contribution to develop their community. Therefore sustainability is the goal of the process. Appropriate management of municipal waste is critical for public health and environmental sustainability. Waste could be a reusable resource if utilized properly. Hence importance must be given to waste management in a sustainable way. By creating awareness in community such as planting a tree to avoid a drastic loss of our biodiversity will contribute to reduce the pressure on the biodiversity. Community learning helps to identify crucial problem which is caused by unsustainable practices both in waste management and other areas in community. The strategy promotes awareness to maintain sustainable environment. By creating educational awareness, a sustainability project contributes to reduce financial cost per year and increase per family income while further improving the environmental, livelihood, and socioeconomic benefit of the community. Theorists and practitioners have highlighted the importance of sustainability in higher education by examining a set of major element of the integrated system of sustainable development. The universities can optimize their role as agents of change with regard to sustainability by adopting a “whole-of-university” approach to sustainability. This approach explicitly links research, educational, operational, and outreach activities and engages students in each. Promoting knowledge on environmental waste management and community gardening are examples by which knowledge can contribute to sustainable rural development and food security particularly for community stakeholders. Furthermore problems associated with environmental mismanagement caused by overexploitation of resources and unsustainable lifestyles could be combated by promoting higher education student as change agent in the community. Promoting higher education student as change agent in sustainability learning would contribute to enhancement and provide solutions that are sustainable to the challenges confronted by the members of the community.